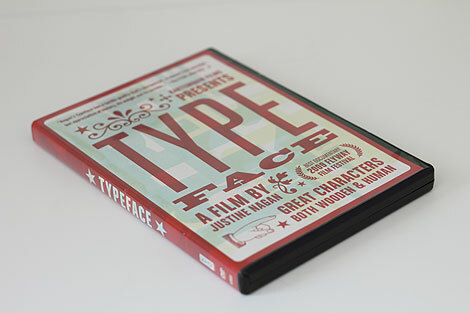 My fascination with type lead me to Justine Nagan's documentary Typeface, recently released on DVD by Kartemquin Films. 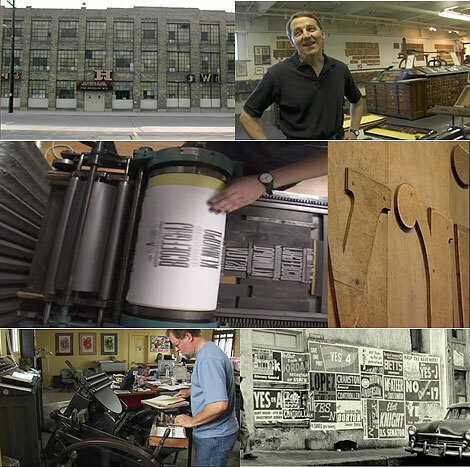 The film features the Hamilton Wood Type and Printing Museum in Two Rivers, Wisconsin (population of 13,000), a town hit hard by globalization. The historic block-long warehouse which houses over 1.5 million wood letterforms, ceased operations in 1985, coinciding with the introduction of the MacIntosh computer. Since the late 1880s the factory was the main provider of wood type in the US. Typeface, created on a $100,000 budget, focuses on the Midwestern museum’s fight to stay connect in today’s digital type revolution. In a time when people can carry computers in their pockets and watch TV while walking down the street, Typeface dares to explore the twilight of an analog craft that is freshly inspiring artists in a digital age. The Hamilton Wood Type Museum in Two Rivers, WI personifies cultural preservation, rural re-birth and the lineage of American graphic design. At Hamilton, international artisans meet retired craftsmen and together navigate the convergence of modern design and traditional technique. After watching the film I left feeling that hopefully a solution can be developed to sustain the museum. In the movie the last surviving Hamilton Type workers are in their early 80s. Their knowledge and process needs to be documented for the younger generations of designers. There is optimism though - the fact that the Hamilton Wood Type Museum is a working museum helps. 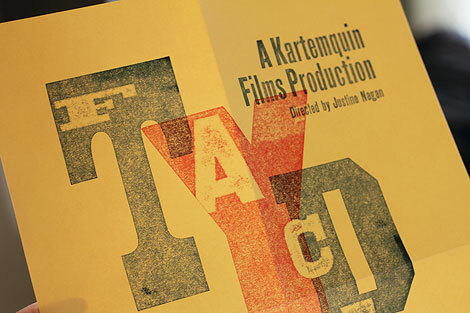 Designers and small press operators who are willing to make the trek can actually experience printing with wood type. The letterforms are not protected behind glass. Visitors can open type drawers, touch, and work with the type. The museum also now has a store to buy original prints produced on site as financial support. It would be neat to travel there some day.